and crippling insecurity born of his childhood. A lover of Jesus and a rebel in the church, Rich refused to let his struggles with his own darkness tear him away from a God he was determined to love. As he struggled with success in Nashville and depression in Wichita, Rich desired most of all to live a life of honest and reckless faith amidst a culture of religion and conformity. Singer and songwriter Richard Wayne “Rich” Mullins was best known for his worship song “Awesome God” which has been embraced as modern classics by many Christians. His music has been covered by many artists, including Caedmon’s Call, Amy Grant, Jars of Clay, Michael W. Smith, Third Day, John Tesh, and Hillsong United. Mullins’ musical career formally began with Zion Ministries in the late 1970s, where he wrote music and performed with a band called Zion. Mullins first solo hit, “Awesome God,” appeared on his third album and brought his music to a wider audience. Rich Mullins was inducted into the Hall of Fame by the Gospel Music Association (GMA) on April 29, 2014. What a wonderful idea! Rich Mullins is such a wonderfully talented artist with songs that have captured my heart and the hearts of many of my family and friends as well. 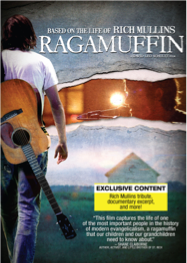 With songs that uplift and entertain, Rich Mullins has become a family favorite in many Christian and even Non-Christian homes. This DVD showcases his background and his desire to share his Love of God with the world. It is an inspiring film and one that many will love! I don't recommend this for younger children as there is a part where Rich Mullins is shirtless and times when he is smoking. Great for older kids and adult fans. One of Mom Loves 2 Read's followers will receive a FREE copy of this DVD from Propeller Consulting, LLC. Rules? Of course there has to be a few rules - open to US and Canada - void where prohibited by law. Must be 18 or older to enter/win. Only 1 entrant per mailing address, per giveaway. If you have won the same prize on another blog, you are not eligible to win it again. Winner subject to eligibility verification. Entries are all optional - winner will have 48 hours to reply to claim prize! Ends July 19th 11:59pm CST. I received free the item(s) mentioned in this post through Propeller Consulting, LLC in exchange for my honest review. Regardless ~ All my reviews are my honest and personal opinion. I am disclosing this in accordance with the Federal Trade Commission’s 16 CFR, Part 255: “Guides Concerning the Use of Endorsements and Testimonials in Advertising.”. I love my God is a Awesome god, great for fellowship song.